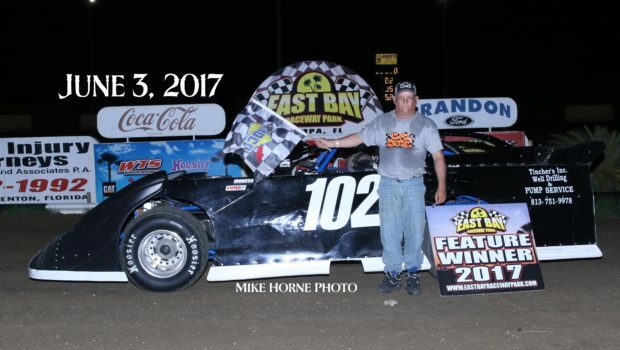 GIBSONTON — At East Bay Raceway it was Tim Gay winning in the Hobby Stocks. Also winning tonight was Greg Pae in the Outlaw Fours, Jason Pope in the Late Model Sportsman, Jamie Tinkham in the Mini Sprints and in the Daytona Antique Auto Racing Association was Bob Jordan in the Midgets, Dan Darnell in the V8/6 Cylinder class and Josh Rynd in the Sprints. In the Hobby Stocks 15-lap feature it was Tim Gay winning with Thomas Pratt finishing in the second spot and Jim Baker picking up third. In the Outlaw Fours 15-lap feature it was defending Champion Greg Pae picking up his second win of the year over Brandon Yates who finished second and Billy Dukes, Jr. third. In the Late Model Sportsman 15-lap feature it was Jason Pope picking up his second feature of the year with Roger Crouse second and Trent Wilson third. In the Daytona Antique Auto Racing Association it was Bob Jorden winning in the Midgets division, Dan Darnell in the v8/6 Cylinder division and John Runn in the Sprints Division. And in the Mini Sprints it was Jamie Tinkham winning the feature. Action continues next Saturday June 10th with the Donnie Tanner Memorial 50-lap Late Model Feature. Also racing will be the Gagel’s Open Wheel Modifieds, V8 Warriors, 4 Cylinder Bombers and the Micro Sprints and will be a Special Event. For information, visit eastbayracewaypark.com or call 813-677-7223. 6. 71 Richard Livernois, Sr.
3. 15 Billy Dukes, Jr.
9. 88 Bob Flemming, Sr.
12. 48 Vernon Hart, Jr.
9. 45 Bill Howard, Sr.
Daytona Antique Auto Racing Assoc. 6. 7 Cush Revet, Jr.